This year prior to the festival, there were giant hurdles of bureaucracy that Matt Williams landlord of The Star Inn had to jump over to bring the delightful palette of sounds that is the unique come-back again draw of this festival. He surmounted the obstacle and once again the festival was delivered with the efforts of his whole team and the marvellous musicians who entertained us throughout the weekend delivering the whole range of blues music this was live music at its best, musicians enjoying playing and an appreciative audience whatever the weather threw at us. This review cannot adequately cover all 29 acts that performed on the three stages, The Green, Garden and Bar what it hopefully achieves will be a flavour of the talent on show and the vitality of the event that is a sell out every year and attracts music lovers from across the land who camp in the allocated spaces nearby and those less hardy myself included who stay in local B&B’s and then there are the people who can simply shut their front door and stroll through the charming village to hear music on their doorstep. The weekend is truly a celebration of live music, good fun, meeting old friends and of course Matt Williams all this makes Bentworth Blues Festival that little bit special and keeps people returning. Opening the proceedings was the talented King Rollo with a complete acoustic set that got the early doors crowd into festival mood, the perfect accompaniment to the first pint of the weekend. Friday saw a mix of bands and solo artists, acoustic and electric including Split Whiskers, Fran MacGillvery & Mike Burke and Will Wilde; though their approach to the blues was different the common link between the three was that they all had women bass players who kept the rhythm as part of the engine house of the band. Split Whiskers managed to deliver many blues standards with a twist of whiskers magic making them come alive and delight in these tunes and lines all over again, this was a band that was a little bit different with a custom-built steel guitar that had its own unique sound. Fran McGillvray & Mike Burke set was a contrast with a great laid-back sound, created by the combination of Fran’s vocals, Mike’s silky guitar licks and beautiful lyrics with the three-dimensional sound completed by the percussive Djembe sound provided by Roger Nunn. The set was a perfect showcase of their style of country blues with tracks from their latest CD “Some Luck” and old favourites. Will Wilde delivered a powerful set with Stuart Dixon (Guitar) Victoria Smith (Bass) & Richard Newman (Drums) providing a great, solid accompanying foundation allowing Will’s powerful combination of vocals and searing harmonica-dominated blues to shine through – what a set. Harmonica playing that ranged from the raw to the gentile, teasing and caressing every displayed emotion as musical pictures were painted that reflected the lyrics. There is no doubt that every time I see this band they get better with a mix of tracks from their forthcoming album ‘Raw Blues’ and some covers. Not the normal string of covers which included a stonking rendition of Buddy Guy’s ‘Smokin Dynamite’ and Earl Thomas ‘ Soulshine’. This band is not just about Will’s talent, with the great emotional lead breaks delivered by Stuart Dixon adding an extra layer of sound that was incorporated to create a complete vibrant sound. Also on fire during the afternoon was Guy Tortora and his band in the bar who had to cope with a stand in bass player as the bass player was stuck in the accident tailback on the motorway which also delayed Stuart Dixon. Laurence Jones Band on the Green bought to the event youthful delivery of high energy blues whether playing self-penned or his covers delighting everyone as he strutted his guitar playing skills with a confidence and a swagger of a young man who loves the music he is playing and wants to entertain you. From youth to experience “Serious Blues“ fronted by drummer Sam Kelly, delivering that funky style, with layers of complexity with the fluidity of a jam creating an exciting and very listenable sound in the bar whilst Blues Associates set themselves up in the garden delivering an eclectic set that got everyone dancing and was a real change from the rest of the bands during the day back in the Garden. The sky’s were darkening as night fell and the last two bands of the first day – Stuart James Band with his rock-blues power trio approach blew away the crowds as they partied the night away with Bentworth festival stalwart Jules Benjamin bringing the first day’s proceedings to an end entertaining everyone and leaving us all very satisfied and already looking forward to the next day as we went humming to our beds from the selection of brilliant tunes we had heard over the last 12 hours. On Saturday, the weather was going to challenge us but started off fair as the Dave Raphael Band delighted everyone on the Green with a great set of traditional blues, including numbers by Koko Taylor. This was a great authentic sound ably complimented by Dave’s laid back vocals and harp playing. With the combination of great grooves and rhythms I really enjoyed the set, and then there was the twist in the tail as Dave took to the keys with a blues/reggae approach that woke everyone up ‘Bleggae’ a first for Bentworth. 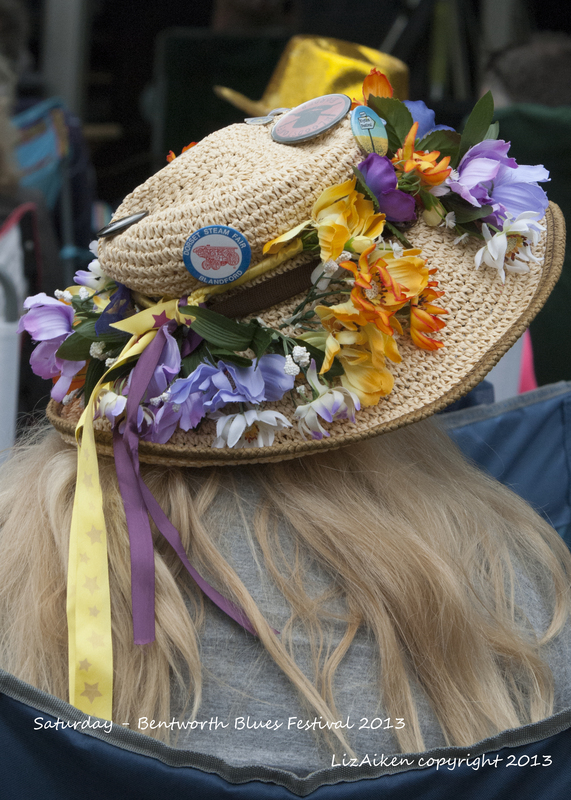 Saturday is traditionally ‘hats day’ and there was a wide array of decorated hats that brightened the proceedings from Sombreros to Top Hats every shape and size was on display. “Red House, the first band in the Garden, certainly knew how to entertain and got the audience participating with lots of dancing this early on the afternoon, they were fun to listen to as they delivered for me a first at a blues festival Pink Floyd’s ‘Another Brick In the Ball’ given the “Red House” Rock n’ Roll treatment and it worked. This was cider driven west country blues that worked well on a Saturday afternoon in the sunshine with a pint in your hand. Now the festival was hotting up as the next three acts were simply brilliant all delivering the blues with passion and all with their own distinctive interpretation of this genre. Kick starting the trio of delights was Ben Poole and his band, a class act and his CD “ Let’s Go Upstairs” showcased throughout the set is certainly one to add to your collection if you enjoy clean, solid and intuitive guitar playing. This is a complete band with an engine house of driving rhythm delivered by Craig Bacon (drums), Barry Pethers (Bass) and adding further depth of tone that complements and adds to the guitar there was Sam Mason on keyboards, and the sultry backing vocals courtesy of Amy Eftekhari. This is a band that delights on lots of levels and just gets better, and Ben is surely master of his own destiny now. He has managed to get the mix of vocal, lead guitar breaks and the showcasing of the band right. He does have clever tricks that work as he does not overuse them and he can definitely play guitar with one-hand as or even more competently than many using both hands. He may sing ‘They Call Me Mr Pitiful’ he is definitely not – this act was SENSATIONAL! Phew who could follow that power guitar demonstration – Clare Free could in the Garden with her own characteristic take on the blues with a style that uses emotions and a gentle touch making the guitar sing in perfect harmony with her voice. This is not a sickly sweet rendition it is full of sugar and spice and the music and lyrics are important to Clare as she introduces her songs which are a delightful mix of re-worked classics and self-penned songs, producing the perfect late Saturday afternoon set. Her band work with her so that the sound is complete and, if I have a comment it is ‘Clare believe in yourself, you are a really good guitar player producing a pleasing sound that is missing from the circuit – we want to see you playing at more gigs now you are back in the U.K’. The final act in my trio of delights is Bentworth festival favourites Northsyde; expectations were high on the Green, with a deputy drummer Joachim Greve the rest of the band Jules Fothergill, guitar; Ian Maurico, bass and fronting the band full of fizz and style is Lorna Fothergill. They ripped through a funky, bluesy rocky set with old favourites and tracks from there brilliant 5* new CD ‘Storyteller’s Daughter’ They are certainly one of the best live acts around confidently delivering their style which is so pleasing on the ear and Lorna’s interaction with the crowd is fantastic as she swapped hats to be part of hat day at Bentworth. Expectations were high and they delivered and to sum it up I overheard someone say “Wow that lady can sing!” The rest of the evening was a triplet of Bentworth stalwarts, these are acts that know what the festival goers want, a party to dance the night away to great music this was achieved by Pethers and Friends – an awesome jam of quality musicians having fun in the Bar, local band Five Field Holler from Hampshire in the Garden with their own take on blues-rock melding styles together so that you get a hint of Chicago, funk and a bit of swampy rock played with passion and vigour. The band also act as deputies for bands throughout the weekend, and more importantly ensure that the sound is perfect for the bands and the crowds and a brilliant job they do every year. 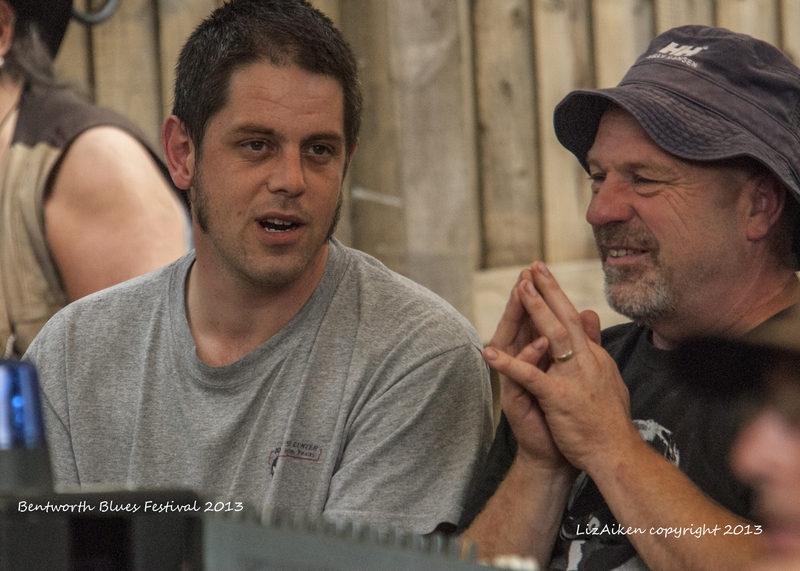 They are soundmen extraordinaire who play jolly good entertaining blues. Ending the evening are the young guns who bring a party-like frenzy to the stage ensuring a feel good feeling at the end of the evening that energising combination of great music, fun, dancing clapping and happy people. Sugar Mama strutted across the stage, this youthful band from the West Midlands play favourites that bring back memories and are a sure bet the evening ends on a high; despite the rain and wind nothing could dampen the delighted festival goers. Sunday, sun was shining and spirits high – this was ‘Shirt Day’ so lots of gaudy prints and T-shirts that never normally see the light of day all adding to the fiesta feel. Sometimes tradition becomes stained and boring but Kyle and Shaw opening the proceedings on a Sunday is one tradition that really works. This laid back acoustic duo are just what everyone needs after a red-hot Saturday evening and heads need the gentle caress of this simple blues played well. ‘Andre and the J-Tones’ made a welcome return and the full sound they achieve with the addition of a superb horn section, they may not be the purist’s band but they are just the thing for the dancers and foot-tappers to delight in. The highlights of Sunday were two acts whose approach to the blues are different ‘BluesBeaten Redshaw‘, who combines a charming mix of Northern banter and blues songs from his new CD along with others. The audience warms to him as he interacts in an open and honest way including eating cheese and biscuits from a member of the audience’s picnic which he reckoned was just perfect with his Guinness. A great foot-stomping number reaching a furiously fast rhythm with his banjo ‘Rollin’ & Tumblin’, a really different version. He walked and charmed his way through the audience including serenading an appreciative dog. He saved his skills on his home-made diddley-bow until the end, when Barry Pethers joined him for lessons, but he soon realised he was not going to out play the master who was simply breathtaking. Look out for this spell-binding precocious talent near you, with his gruff voice and rough rootsy guitar a delicious combination of musicality. The only point is he needs to broaden his repertoire so that he has plenty of tunes in his back-pocket because audiences will always want more. The other act was Paint It Blue, a young five-piece band who deliver the blues with plenty of soul creating a freshness of sound. Vocalist Hannah Robinson has a beautiful voice and is ably supported by a quartet of skill on Bass, Blues Harp, Guitar and Drums. The whole band mesh together delivering music that fits together like a perfect-fitting glove. This is a comfortable sound that makes you want to listen to more, no wonder they are in demand at Blues Clubs and Festivals they bring real magic to any event. They delight in what they sing and play and in return the audience appreciate the music this is truly dancing blues. I have wanted to catch this band ever since I heard their début CD which was a really good listen but as ever live music gave us a little bit more. Loved their version of ‘My Babe’ and their self-penned numbers; with the intricate drumming in combination with the subtle accurate harp playing they deliver true authentic blues. As ever the stars that stole the show on Sunday were ‘Babajack‘, today in duo form with the effervescent Becky Tate on Percussion and Vocals and Trevor Steger on Guitar and Harp this is a winning combination full of style, energy and blues given a distinctive twist taking the sound back to Africa with the use of raw percussion courtesy of the Djembe and Cahon combined with home-made wine box guitars and with the clever use of the harp to blend the music together. The sound created is fantastic but it is Becky’s voice that soars above delivering the lyrics with passion this is a band that delight in each other’s skills and truly understand the essence of the blues. They delivered a set that was all the shade of emotions, a musical equivalent to all the colours of the rainbow. This was an opportunity to showcase the tracks we all love including Leadbelly’s ‘Gallows Pole’ and the new stuff from their forthcoming much-anticipated album ‘Running Man’. Bentworth was rewarded with the first live rendition of the title track which is definitely a little bit special. The rest of Sunday past with a wall of sound including blues soul delivered by ‘Soul Alliance‘, skillful playing by ‘Ivan McCormick’ and then the Big Jam at the end – leaving everyone happy with the scope of music they had heard and penciling into their diaries next year’s festival. I’d like your permission to reprint this (proably slightly shortened) in next months Blues In The South. OK?